Victorian tailcoat jacket by Punk Rave. Dark red fabric with black lace and crochet border. Short front cut with wide back bustle tail. Puffed sleeves. 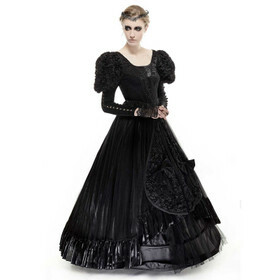 Victorian tailcoat jacket by Punk Rave. Dark red fabric, full covered with black lace and rich crochet border.. Short front cut with wide back bustle tail. Inside black satin lining. Hook and eye front closure. Transparent lace contrast at he neckline. High stand-up collar with lace and fur. Puffed sleeves.